Well, it's Dec 17, and we're finally in Marina Palmira. We had to be towed over yesterday as our engine wouldn't run the raw water through it. While we were in Bercovich Boat Yard we heard old sailors who had lived there forever tell us it was like the Hotel California. "You can check out but you can never leave" and when we got dropped in the water and found out the engine wasn't sucking up the raw water we felt like they were right. So we opted to be towed to the Marina, figuring we'd work on the engine here. What a change! No more cold showers in a machine shop. Oh yeah baby, we hit the big time. I'm talking HOT SHOWERS. You'll never know how precious a hot shower is until you live on a boat. 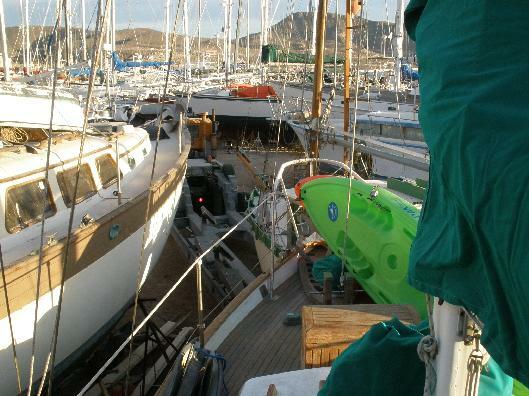 Living in a boat yard is truly an experience everyone should do at least once in their lives. There are so many colorful words to describe it. All in all we did meet some new friends and actually ran into some old ones too. While in the boat yard we ran into Mick and Joyce of "Rhumbline". What a pleasent surprise! We sailed with them in 06. Their Catamaran was having work done there so one night we went over for tuna that Mick caught. I can't describe how good it was. The yard also had a little Christmas party on Henry's boat. Henry will be 90 in Feb. and still sharp as a tack I guess this sailing stuff is healthy for you. I'd like to say this about Abel and his crew. They treated us very well and went out of their way to accommodate us. There are so many stories I could tell but I thought I'd let the pictures do the talking.